Thika road, mainly known as Thika superhighway, is a major class A road that links Nairobi City and Thika town, in Kiambu County. Several businesses along Thika superhighway have been established and the existing ones boosted by the increased traffic and people. According to the government the road covers a total population of approximately 1 million and transverses Nairobi Metropolitan densely populated residential areas of Kasarani, Zimmerman, Kahawa, Githurai, Ruiru, Juja and ends in Thika. The road which is 50km long saw its upgrade include construction of additional lanes and the removal of roundabouts at several locations that were replaced by interchanges. The people who mainly benefits from the road are people living along the route and more importantly, the commuters travelling to the Nairobi city’s Central Business District (CBD) for work. Other activities along the road include businesses, light manufacturing industries, educational institutions, and farming activities like flower, tea, coffee farming, and livestock rearing. It also benefits small scale business operators in the road side most notably Maasai market at Globe Cinema. Students attending universities established along the road are also greatly benefiting, with United States International University-Africa, Kenyatta University, Pioneer International University, KCA University, and Jomo Kenyatta University of Agricultural Technology (JKUAT) that cater for thousands of students who travel efficiently to attend their classes during the evening. Previously the road was notorious for traffic jams that sometimes lasted for hours during the rush hours, with the consequences being excess fuel consumption and high level of vehicular pollution. This road also witnessed frequent road accidents with the increase in the number of automobiles. But since its upgrade, the commuters now enjoy faster and comfortable journeys with travel time from Nairobi to Thika dropping to around 30-45 minutes. The road is also a major gateway linking the capital Nairobi with other major towns in Central, Eastern and North-Eastern parts of Kenya up to the Ethiopian border town of Moyale through Isiolo and Marsabit. The link to Moyale has seen an increase in trade movements as passenger vehicles, and trucks transporting light and heavy goods are able to link easily with Ethiopia and Somalia. This linkage also forms a vital achievement in the construction of the Great North-Trans African Highway, which is expected to link Cape Town, South Africa and Cairo, Egypt. The road is connected to other major roads in the city which includes Murang’a road which was widened to six lanes and runs up to the CBD; it also connects to Haile Selassie Avenue and Ladhies road through Race Course Road and Ring Road Ngara; and Forest road, was widened into a six-lane which connects to Limuru road and Waiyaki/Uhuru Highway exchange. 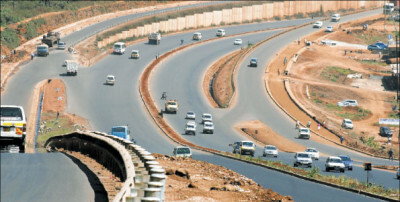 The section of the road between Muthaiga roundabout and Ruiru also forms part of the Northern Bypass that links to Limuru road; and Easten Bypass that connects to the densely populated Eastlands area of Nairobi. The road was completed and officially opened on February 2012 after the construction works commenced in January 2009. The construction was undertaken by three Chinese companies; China Wu Yi Company which built the road from Uhuru Highway and extended up to Muthaiga Roundabout, Sinohydro Corporation which built from Muthaiga Roundabout up to Kenyatta University, and Sheng Li Engineering Construction which did the last part that extends up to Thika. The road is estimated to have cost US $360 million (Ksh27 billion) with African Development Bank (AfDB) contributing the largest share at US $180 million with $5 million of the funds contributed by AfDB used in the feasibility study and detailed design of the highway. The Kenyan government funded the project to a tune of US $80 million, with the other financier, People’s Republic of China through EximBank of China, contributing US $100 million which was mainly used for the construction of the road between Kenyatta University and Thika town. Thika superhighway forms a significant part of the Kenya’s Vision 2030, a development blueprint that is intended to make Kenya as middle income country by the year 2030.